Salon Reception Areas Need To Be Rethought Of… But Why? Lately, whether they have a dedicated team or not, I have been on a mission to revolutionise my clients’ salon reception areas and desks. More specifically, I focus on the training for reception and on how to turn the first and last client touch point into a strong commercial asset generating impact on their revenue. Ok, so “revolution” might come off strong, but being French, I thought it would represent my mindset in the changes I implement with my clients! Ready? It’s about time I got vocal about it! During all the mystery shopping experiences I conduct, I usually stand beside the retail display and wait to see if anyone approaches me… Surprisingly enough, it doesn’t happen very often. The hustle and bustle of the salon takes over, and when there is no reception team, then I often understand I’m meant to pick up, pay and go. Staff body language is distant. The desk is a barrier, especially if the receptionist is sitting down while talking to the client. Habits undermine the client’s experience. The routine takes over, and no suggestions on how to improve ‘x’ or ‘y’ are made. There is a lack of merchandising development: the retail area is sometimes away from the desk and other times impulse buys aren’t set up; if not both at once. The reception team lacks training. Because this area of the salon can be so busy, focusing on the priorities can be overwhelming for any staff. Retail sales are random; there are no official systems in place. If a client’s spend and loyalty depends on the experience they have rather than the treatment itself, then it’s only normal we rethink the design of our retail and reception areas. To become more than a salon, to be an experience. 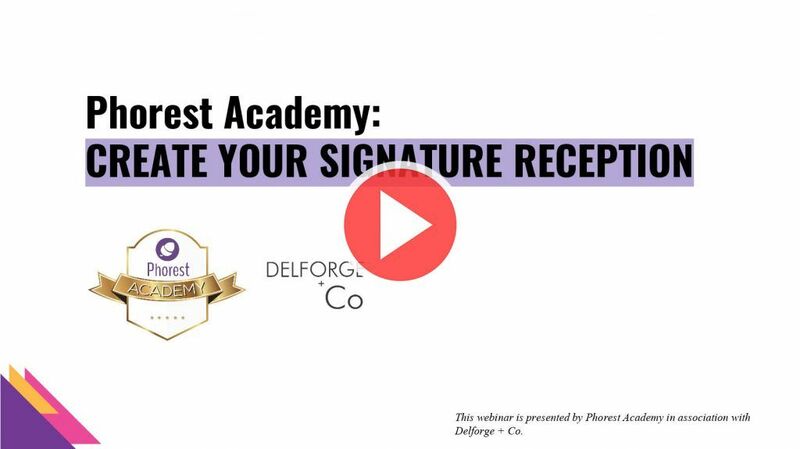 Watch on-demand: click on the image to access this masterclass recording. Salon reception areas at the heart of the customer journey; they are a client’s first and last point of contact. Because they’re so central, it’s crucial to make them memorable and get the experience right. From a customer’s point of view, the reception adds value to the treatment. It enhances the feelings they’ve experienced in your salon or spa and so the smoother the customer journey, the more they leave with a sense of contentment. Inherently creating a domino effect, the more content they are, the more likely they are to come back and/or to recommend you. This is why when you focus on delivering consistent and first-class customer experience, pricing becomes irrelevant. Put yourself in your clients’ shoes for a moment and think about the last time you went to a salon or spa. How did the reception area make you feel? Was it an irritating experience? Did everything go smoothly, or did you feel like the staff didn’t know you? A client will either enter a treatment thinking: “I hope this gets better…” or “Wow, this is amazing so far! I can’t wait to see what’s coming next.” And while it all starts with a first impression, we are often inclined to forget that the said impression will also be influenced by the quality of the treatment and what happens at the very end of the visit. As we remember the end as a rule, I suggest testing this regularly; through the means of mystery shoppers or simply by calling existing clients to ask for feedback. Generate best practice from the results you are getting. Oh, and before I forget, this should happen whether you employ receptionists or not! get your receptionist to wear an apron and used an iPad, etc. Personally, I’m a fan of small standing desks, like the hostess’ ones you see in restaurants. Those desks allow your staff on reception to walk to customers when they’re looking at your retail displays or just as they come in. They encourage a more opened and welcoming experience. Look at your desk right now; what does it represent? How many things do you have on it? Are they all necessary? Can you see a way to make your retail space work hand-in-hand with your salon reception? Can your receptionist become more of a retail coordinator? To increase your salon’s revenue, you must start encouraging retail & customer experience culture. Featured imaged shot on location of David Ryan Salon, in Dublin. © 2017 Phorest Salon Software.